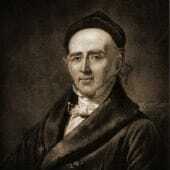 World Homoeopathy Awareness Week (April 10th-16th) celebrates the birth of Samuel Hahnemann, the respected German physician recognised as the father of homoeopathy. April 10th commemorates his birthday. During Homoeopathy Awareness Week, people celebrate this occasion and use the opportunity to raise awareness of homoeopathy and how it helps improve health and wellbeing. 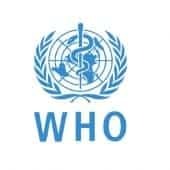 The primary goals of World Homoeopathy Awareness Week are to raise public awareness of homoeopathy and improve accessibility to homoeopathy. It inspires a variety of public events. Free lectures, media interviews & educational posts, to name just a few, are provided and shared in over 40 countries. We encourage all members of the CAM community to participate and celebrate the shared successes of homoeopathy. 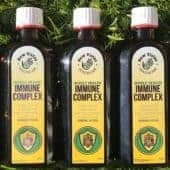 We are delighted to announce the launch of ‘Whole Health Immune Complex’, a colloidal mineral solution for optimal immunity. As with any mineral supplement, a CAM Provider can evaluate individual health requirements and needs. March 11th – 17th is ‘Brain Awareness Week’. It is a global campaign to increase public awareness of the progress and benefits of brain research. A study published in the Journal ‘Nutrition’ supports the use of vitamins and docosahexaenoic acid (DHA) in the elderly population to help combat brain aging. Dementia related diseases such as Alzheimer’s are prevalent worldwide but the focus is primarily on offering palliative treatment of symptoms for the patient. A more promising alternative in disease prevention is to maintain a healthy brain for as long as possible. This study investigates the optimal supply of nutrients necessary for maintaining normal functioning of the brain. One of these nutrients is docosahexaenoic acid (DHA). This omega-3 fatty acid is found in high levels in algae oil. 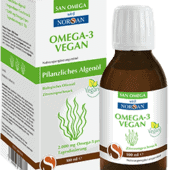 The Norsan Omega 3 Vegan Oil contains 1176mg of DHA per dose. Ideally a CAM Provider can evaluate individual health requirements and devise a suitable personalised health plan so as to monitor and meet a person’s needs. This review concludes that the use of vitamin and DHA supplementation for the aging population is a viable alternative approach to delaying brain aging and for protecting against dementia. A recent study published in the Journal, ‘Evidence-based Complementary and Alternative Medicine’ supports the consumption of Noni fruit juice to regulate elevated blood sugar levels in patients with Type II Diabetes. The number of patients diagnosed with Type II diabetes is on the increase worldwide. 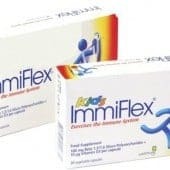 The primary goal of Type II Diabetes management is to reduce the fasting blood sugar level. This is best achieved under the guidance of a CAM Practitioner, where a person’s individual needs can be monitored. The fruit of the tropical plant Morinda citrifolia L. (Noni) has been used as a food and medicine by indigenous people of South East Asia and Polynesia for hundreds of years for multiple reasons among which is the treatment of diabetes. 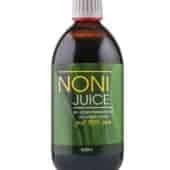 In the last 20 years Noni juice has become popular worldwide as a wellness drink. Ideally a CAM Provider can evaluate a person’s health requirements and devise a suitable plan to achieve optimal health goals. The article discusses the benefits of Noni juice as a suitable additive to the diet of diabetic patients. 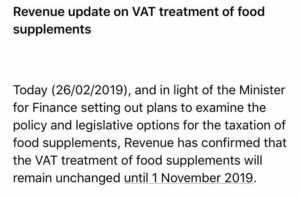 We are delighted to announce that Revenue have confirmed that the VAT on food supplements will remain unchanged until November 1st, 2019. Well done to all who campaigned against this proposal. 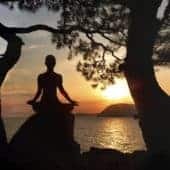 Many of us know that the brain sends information and issues commands to the heart and body in the form of neural signals but did you know that the heart possesses a heart-brain connection composed of about 40,000 neurons that can feel, sense, remember and learn? According to Harvard Medical School, chemical “conversations” between the heart and brain affect both organs. Research has found that negative emotions throw both heart rhythms and brainwave patterns out of sync. On the other hand, when a person experiences positive emotion, heart rhythms & brainwave patterns are harmonious and coherent. When we experience sincere and positive feelings such as love or appreciation, the heart processes these emotions & feel-good information is sent throughout the entire body. A great way to help boost and enhance positive emotion is with the Zephorium Aura Sprays. They combine colour therapy, aromatherapy, crystals and positive affirmations in beautiful chakra tonics. There are two sprays designed specifically for the Heart Chakra; Love & Surrender and Balance & Protection . The Love & Surrender Aura Spray is a powerful combination of pure Rose Oil and Rose Quartz Crystal properties. Rose oil helps to open the heart chakra to loving self and others. Its nurturing fragrance is said to help relieve grief and sadness and focuses on healing. The Balance & Protection Aura Spray is another powerful formulation, combining Jasmine Oil and Emerald Crystal vibrations. Jasmine is an uplifting and inspiring fragrance. 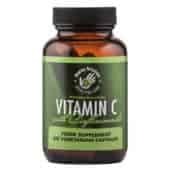 The tonic protects heart vitality, encouraging areas of balance or finding middle-ground. Both Aura Sprays promote and support a healthy heart-brain connection. Other remedies known for their effect on positive emotions and heart energy are the Australian Bush Flower Essences. The Relationship Essence is a combination essence that can help enhance the quality of relationships. When used regularly, these drops can help break early negative family conditioning or patterns which can hinder adult relationships. Combine with Sexuality Essence to improve intimacy this Valentine’s. Michael Morrison was well known and respected througout our CAM community. He worked from Tuan Health Sanctuary in Co. Wexford. 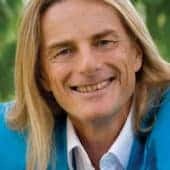 Mike had a huge personal connection with integrative medicine. He was born with cystic fibrosis, a genetic lung disorder. His family were advised of low survival rates – he may not survive beyond his 12th birthday. Against the odds, Michael had 36 happy years with his family. He wrote books on personal well-being and spiritual development. 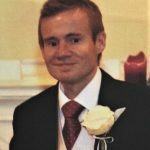 He share his knowledge and experiences in the hopes of progressing the environment for other CF patients. His story is featured in this month’s edition of Positive Health Online. His parents, Breda and Ed, discuss how CAM therapies such as homeopathy, flower therapy and spirituality helped strengthen and encourage Michael during his life. They note how his quality-of-living was enhanced and how he used his own experiences to teach and help others with cystic fibrosis. Michael passed on in 2014 but his kind, gentle nature lives on through his books and in the memories of all who had the pleasure to know him. To view Michael’s article, click here.